The sun came out for our final drive to the Alps, a welcome change from the recent grey days, it warmed and cheered us as we drove further south, finally getting some glimpses of snow clad mountains against a blue backdrop. We made a final stop for groceries on the way so that we would have enough meals to allow us to settle at our first location for at least a week. Ski resort shops are notoriously expensive. We had decided to head for Vaujany, a small village resort with a ski area linked to Alpe d’Huez. It has a small aire with 10 spaces so we were crossing our fingers that there would be room for us. 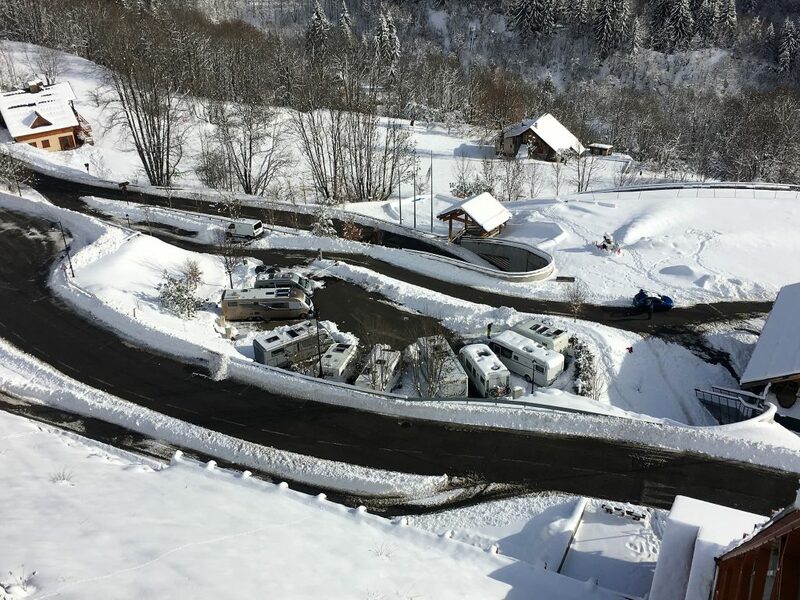 A recent facebook post on the Motorhome and Ski facebook page from a couple of days before had said there were three spaces so we were hopeful. We also knew that there was plenty of alternative parking (in low season at least) just in case the aire was full and we needed to camp out for a day or two. 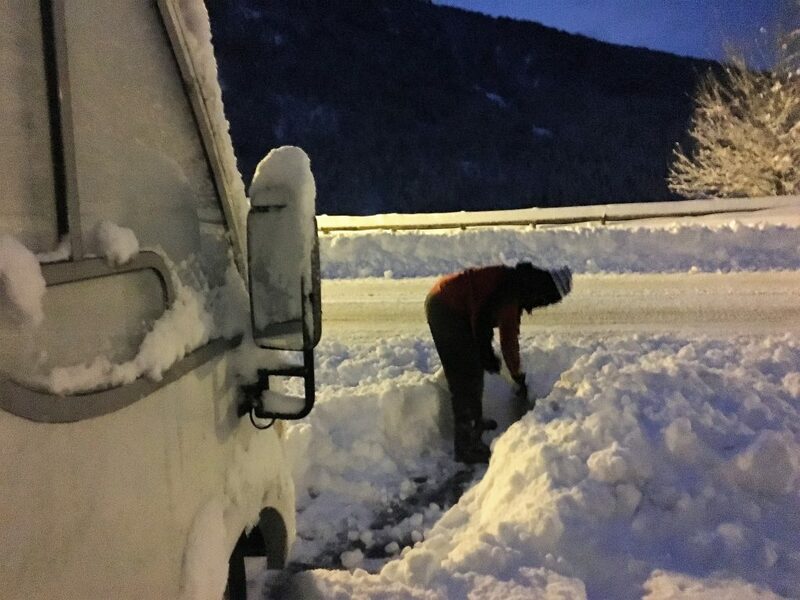 It’s not our first time skiing in the motorhome – we went to Livigno last year – but it is our first time trying to ski using mostly aires. It is also, surprisingly, the first time we have been skiing in France. Previously we have skied in Canada, Bulgaria and Italy, but, despite France being the most obvious choice for a ski holiday we just haven’t done it. So we were looking forward to some new experiences. As we got into the mountains the clouds started to gather and the weather turned wet. This didn’t bode well for higher altitudes where the rain might be sleet or snow. We considered leaving Vaujany for another day and heading for a parking spot in the valley, but pressed onwards nonetheless; we would turn around if it got too much. The final ascent to Vaujany is up hairpin bends from the valley to the village. It’s a wide road and would be quite easy in good weather, but the light covering of snow made it a tricky drive. Not enough snow had fallen for snow chains to be used, so we were reliant on our tyres and Paul’s careful driving to stop us from wheel spinning and skidding on the road. It was late afternoon by the time we got here, so most of the traffic had been coming downhill, which meant that the downhill side of the road was much more clear. We ended up driving a lot of the way on the wrong side with me peering ahead or upwards to spot oncoming traffic. At one point a four wheel drive shot past us, obviously frustrated by our slow pace, but we weren’t going to be intimidated into going any faster. We finally made it up to the village and abandoned the sat nav to follow the signposts to the aire. As we drove down to the barrier we could see that three spaces were free, we were in luck. But luck was not completely on our side; the aire operates on a barrier entry system, you have to pay for at least 24 hours to get the barrier to raise and it was having none of it. Our cards, whether credit or debit, mastercard or visa, were not working. We got a variety of error messages but nothing would let us through. Luckily the aire is small and everyone could see us struggling. A very helpful French couple rang the tourist office for us, but they don’t deal with the aire, so all they could do was pass on a message to the Mairie (town hall) to send someone to sort it out in the morning. Seven thirty, we were told. Well that was a bit of a bummer as we rarely get up before eight thirty, but if it meant that we would secure a spot in the aire we would lever ourselves out of bed and get to the entrance. We ended up parked next to another motorhome in the coach parking just above the aire. Overnight the snow fell, we could see the flakes falling as we ate our dinner and we could hear them pitter pattering on the roof through the night. The weather forecast on our phones had predicted lows of -10ºC, so we ran our blown air heating all night. Each time the fan switched on or turned off we woke up. Each time we woke up we could hear the snow falling. The sound started to get that deadened quality, like being trapped under a duvet, we knew there was going to be quite a lot of snow when we got up. Tired and testy, we dragged ourselves out of bed at 7 to find that there was about 30cm of snow around us. Just up to the level of the door. The snowplough had been through but there was about 2 meters of uncleared snow in front of us. 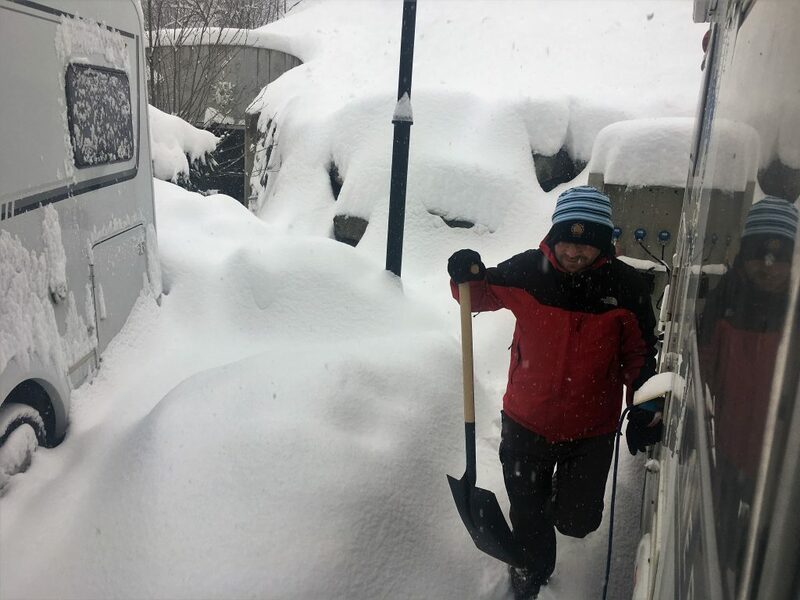 Paul got himself kitted up and went outside to shovel while I readied the van. Then I sat and watched while Paul and the French man next door shovelled away – they were also intending to go down to the aire that morning. Feeling a bit useless I wandered down to the aire to see what it was like. The snowplough had only made it as far as the slip road so there was a whole heap more snow moving to be done. There was no sign of anyone from the Mairie, and, when they were finally contacted they said that it would be 10am at the earliest. We commenced shovelling, trying to clear our parking spaces and a route to them. 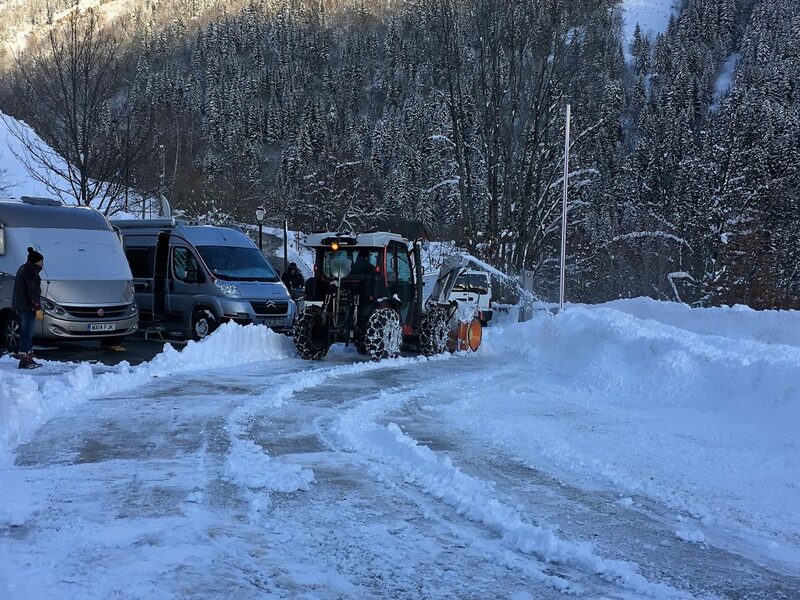 It was early afternoon before we eventually saw anyone from the Mairie, they bought a snowplough with them which proceeded to clear away what was left to do. If only they had arrived earlier we wouldn’t have had to do 4 hours of backbreaking shovelling. Never mind. I wrestled with the snow chains, feeling proud of myself when I managed to get them on the tyres without any assistance. This is the first time we have had to use them in anger. Paul drove Bertie down to the aire on the snow packed roads and we were in. Sort of, the machine still wouldn’t take our cards so the barrier was raised to let us through and we were left with a rather vague instruction to go and settle up with the Mairie at some point. 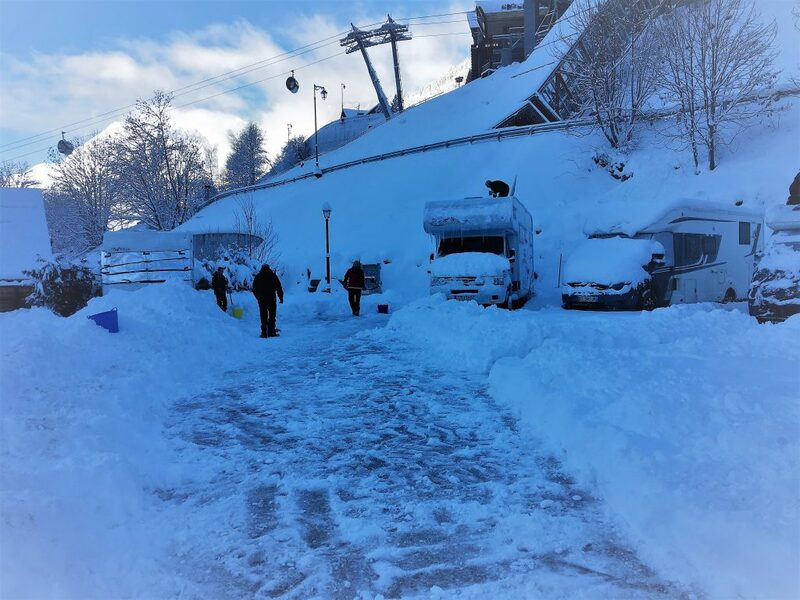 Snow moving – why did we bother? That afternoon we explored the village, picking up a variety of information from the Tourist Office and locating important things like shops and bars. We didn’t have the energy for skiing and felt rather inadequate when we saw our new French neighbours heading out for the slopes.